Abandoned by her mother as a toddler and only occasionally visited by her volatile father who keeps dangerous secrets, Justine is raised solely by her Pop, an old man tormented by visions of the Burma Railway. Justine finds sanctuary in Pop’s chooks and The Choke, where the banks of the Murray River are so narrow they can almost touch - a place of staggering natural beauty that is both a source of peace and danger. Although Justine doesn’t know it, her father is a menacing criminal and the world she is exposed to is one of great peril to her. She has to make sense of it on her own - and when she eventually does, she knows what she has to do. A brilliant, haunting novel about a child navigating an often dark and uncaring world of male power, guns and violence, in which grown-ups can’t be trusted and comfort can only be found in nature, The Choke is a compassionate and claustrophobic vision of a child in danger and a society in deep trouble. 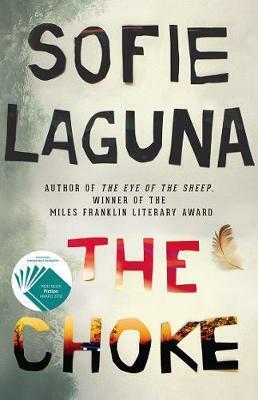 Sofie Laguna, winner of the 2015 Miles Franklin Award for The Eye of the Sheep, once again shows she is a writer of rare empathy, originality and blazing talent. Sofie Laguna’s third novel for adults gave me that sweet reading moment we all pine for – when you realise that your lived world is colliding with that of the page. Reading becomes the sole purpose of the day. You cannot put the book down because you are immersed, completely and utterly, until the story finishes. Laguna was awarded the 2015 Miles Franklin Literary Award for her creation of Jimmy Flick in The Eye of the Sheep. It is possible that this novel will give her even more, deserved, acclaim. The Choke centres on ten-year-old Justine. Her voice narrates the affecting and demoralising consequences of male violence in blocking her potential pathways. The title refers to the banks of the Murray River, where the river runs narrow, occasionally flooding the surrounds. It is here that the story is staged. Laguna elegantly portrays the dampness, the dirt, the longing and the knowledge of those who live so near the Murray River – and so far from helping hands. Laguna’s ability to expose isolation and despair is remarkable. The deeper I immersed myself in Justine’s world, the sadder and more choked I became. Witnesses to Justine’s life are held up as beacons of possibility, but still – as it is with deep-set poverty – they’re unable to change the direction of this young girl’s life. Laguna has beautifully captured the bewilderment of childhood and the emergence of adulthood in her character of Justine. It is so unquestionably heartbreaking. Readers who enjoyed Tim Winton’s Cloudstreet, or Georgia Blain’s Between a Wolf and a Dog, will be delighted with this novel. This is an extraordinary read.